Does music rule your life? Are you unhappy with the music that you've been hearing up until this moment? So you really want to create your own music and really listen to your own music? Do you want to mix and produce your own music? There is now a device out on the market that will let you do just that. 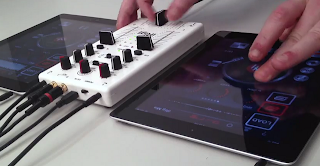 It is the first mobile mixer and it is available for your iPad, iPod Touch and your iPhone. Created by IK Multimedia, it is called iRig MIX. It is must like a professional DJ mixer and has effects like EQ and Volume controls as well as cross fader cues. It is portable and you can use it with many of the DJ mixing apps that are available on the internet. You can use it with two devices and each device can be plugged into each of the independent channels. If you have only one device, then you can set that up also. You can use it to mix any type of audio source such as an MP3 player or a CD player. If you are ready to be a DJ or you just want to mix and produce your own music, iRig MIX is for you. You can create beats, or create the kind of music that you've always wanted to hear. You can let your friends and family hear the mixes that you have created at a party or at your home. You have regular RCA connectors so that you can plug and connect anywhere and just start your mixing. You get 4 free apps with this rig. These apps are DJ Rig, AmpliTube, VocaLive and GrooveMaker. So if you are ready to create your own music, there is nothing stopping you from doing just that. Time to get busy and make your own music. 0 Respones to "The iRig Mix Device"